Rabbit polyclonal Collagen II antibody. Validated in WB, IP, ELISA, IHC, ICC/IF and tested in Mouse, Rat, Sheep, Chicken, Cow, Dog, Human, Pig. Cited in 167 publication(s). This antibody reacts with Type II collagens and shows negligible (less than 1%) cross reactivity with Type I, III, IV, V or VI collagens. Nonspecific cross reaction with other human serum proteins or non collagen extracellular matrix proteins is negligible. Collagen Type II from human knee cartilage and bovine nasal cartilage. 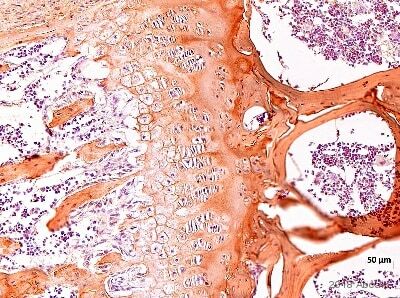 IHC-P: Human bronchiolar cartilage; Mesenchymal stem cells. 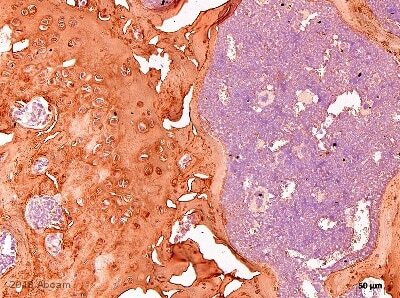 ICC/IF: Human articular chondrocytes; Human bronchiolar cartilage; Mesenchymal stem cells. This antibody was prepared by immunoaffinity chromatography using immobilized antigens followed by extensive cross adsorption against other collagens, human serum proteins and non collagen extracellular matrix proteins to remove any unwanted specificities. Our Abpromise guarantee covers the use of ab34712 in the following tested applications. WB 1/5000 - 1/10000. Predicted molecular weight: 142 kDa. This product is not recommended for use under denaturing conditions in WB, IP, and ELISA. We would suggest testing it under native conditions. Type II collagen is specific for cartilaginous tissues. It is essential for the normal embryonic development of the skeleton, for linear growth and for the ability of cartilage to resist compressive forces. Isoform 2 is highly expressed in juvenile chondrocyte and low in fetal chondrocyte. Defects in COL2A1 are the cause of spondyloepiphyseal dysplasia congenital type (SEDC) [MIM:183900]. This disorder is characterized by disproportionate short stature and pleiotropic involvement of the skeletal and ocular systems. Defects in COL2A1 are the cause of spondyloepimetaphyseal dysplasia Strudwick type (SEMD-STR) [MIM:184250]. A bone disease characterized by disproportionate short stature from birth, with a very short trunk and shortened limbs, and skeletal abnormalities including lordosis, scoliosis, flattened vertebrae, pectus carinatum, coxa vara, clubfoot, and abnormal epiphyses or metaphyses. A distinctive radiographic feature is irregular sclerotic changes, described as dappled in the metaphyses of the long bones. Defects in COL2A1 are the cause of achondrogenesis type 2 (ACG2) [MIM:200610]; also known as achondrogenesis-hypochondrogenesis type II. ACG2 is a disease characterized by the absence of ossification in the vertebral column, sacrum and pubic bones. Defects in COL2A1 are the cause of Legg-Calve-Perthes disease (LCPD) [MIM:150600]; also known as Legg-Perthes disease or Perthes disease. LCPD is characterized by loss of circulation to the femoral head, resulting in avascular necrosis in a growing child. Clinical pictures of the disease vary, depending on the phase of disease progression through ischemia, revascularization, fracture and collapse, and repair and remodeling of the bone. Defects in COL2A1 are the cause of Kniest dysplasia (KD) [MIM:156550]; also known as Kniest syndrome or metatropic dwarfism type II. KD is a moderately severe chondrodysplasia phenotype that results from mutations in the COL2A1 gene. Characteristics of the disorder include a short trunk and extremities, mid-face hypoplasia, cleft palate, myopia, retinal detachment, and hearing loss. Defects in COL2A1 are a cause of primary avascular necrosis of femoral head (ANFH) [MIM:608805]; also known as ischemic necrosis of the femoral head or osteonecrosis of the femoral head. ANFH causes disability that often requires surgical intervention. Most cases are sporadic, but families in which there is an autosomal dominant inheritance of the disease have been identified. It has been estimated that 300,000 to 600,000 people in the United States have ANFH. Approximately 15,000 new cases of this common and disabling disorder are reported annually. The age at the onset is earlier than that for osteoarthritis. The diagnosis is typically made when patients are between the ages of 30 and 60 years. The clinical manifestations, such as pain on exertion, a limping gait, and a discrepancy in leg length, cause considerable disability. Moreover, nearly 10 percent of the 500,000 total-hip arthroplasties performed each year in the United States involve patients with ANFH. As a result, this disease creates a substantial socioeconomic cost as well as a burden for patients and their families. Defects in COL2A1 are the cause of osteoarthritis with mild chondrodysplasia (OACD) [MIM:604864]. Osteoarthritis is a common disease that produces joint pain and stiffness together with radiologic evidence of progressive degeneration of joint cartilage. Some forms of osteoarthritis are secondary to events such as trauma, infections, metabolic disorders, or congenital or heritable conditions that deform the epiphyses or related structures. In most patients, however, there is no readily identifiable cause of osteoarthritis. Inheritance in a Mendelian dominant manner has been demonstrated in some families with primary generalized osteoarthritis. Reports demonstrate coinheritance of primary generalized osteoarthritis with specific alleles of the gene COL2A1, the precursor of the major protein of cartilage. Defects in COL2A1 are the cause of platyspondylic lethal skeletal dysplasia Torrance type (PLSD-T) [MIM:151210]. Platyspondylic lethal skeletal dysplasias (PLSDs) are a heterogeneous group of chondrodysplasias characterized by severe platyspondyly and limb shortening. PLSD-T is characterized by varying platyspondyly, short ribs with anterior cupping, hypoplasia of the lower ilia with broad ischial and pubic bones, and shortening of the tubular bones with splayed and cupped metaphyses. Histology of the growth plate typically shows focal hypercellularity with slightly enlarged chondrocytes in the resting cartilage and relatively well-preserved columnar formation and ossification at the chondro-osseous junction. PLSD-T is generally a perinatally lethal disease, but a few long-term survivors have been reported. Defects in COL2A1 are the cause of multiple epiphyseal dysplasia with myopia and conductive deafness (EDMMD) [MIM:132450]. Multiple epiphyseal dysplasia is a generalized skeletal dysplasia associated with significant morbidity. Joint pain, joint deformity, waddling gait, and short stature are the main clinical signs and symptoms. EDMMD is an autosomal dominant disorder characterized by epiphyseal dysplasia associated with progressive myopia, retinal thinning, crenated cataracts, conductive deafness. Defects in COL2A1 are the cause of spondyloperipheral dysplasia (SPD) [MIM:271700]. SPD patients manifest short stature, midface hypoplasia, sensorineural hearing loss, spondyloepiphyseal dysplasia, platyspondyly and brachydactyly. Defects in COL2A1 are the cause of Stickler syndrome type 1 (STL1) [MIM:108300]; also known as vitreous type 1, or membranous vitreous type. STL1 is an autosomal dominant form of Stickler syndrome, an inherited disorder that associates ocular signs with more or less complete forms of Pierre Robin sequence, bone disorders and sensorineural deafness. Ocular disorders may include juvenile cataract, myopia, strabismus, vitreoretinal or chorioretinal degeneration, retinal detachment, and chronic uveitis. Robin sequence includes an opening in the roof of the mouth (a cleft palate), a large tongue (macroglossia), and a small lower jaw (micrognathia). Bones are affected by slight platyspondylisis and large, often defective epiphyses. Juvenile joint laxity is followed by early signs of arthrosis. The degree of hearing loss varies among affected individuals and may become more severe over time. Syndrome expressivity is variable. Defects in COL2A1 are the cause of Stickler syndrome type 1 non-syndromic ocular (STL1O) [MIM:609508]. STL1O is an autosomal dominant form of Stickler syndrome characterized by the ocular signs typically seen in STL1 such as cataract, myopia, retinal detachment. STL1 systemic features of premature osteoarthritis, cleft palate, hearing impairment, and craniofacial abnormalities are either absent or very mild in STL1O patients. Defects in COL2A1 are a cause of rhegmatogenous retinal detachment autosomal dominant (DRRD) [MIM:609508]. Rhegmatogenous retinal detachment most frequently results from a break or tear in the retina that allows fluid from the vitreous humor to enter the potential space beneath the retina. It is often associated with pathologic myopia and in most cases leads to visual impairment or blindness if untreated. Belongs to the fibrillar collagen family. Contains 1 fibrillar collagen NC1 domain. Proline residues at the third position of the tripeptide repeating unit (G-X-Y) are hydroxylated in some or all of the chains. Proline residues at the second position of the tripeptide repeating unit (G-X-Y) are hydroxylated in some of the chains. The N-telopeptide is covalently linked to the helical COL2 region of alpha 1(IX), alpha 2(IX) and alpha 3(IX) chain. The C-telopeptide is covalently linked to an another site in the helical region of alpha 3(IX) COL2. 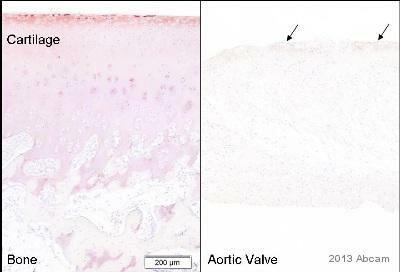 ab34712 (1:400, 45 min RT) showed moderate staining in FFPE human bronchiolar cartilage. Slides were steamed in 0.01 M sodium citrate buffer, pH 6.0 at 99-100°C - 20 minutes for antigen retrieval. 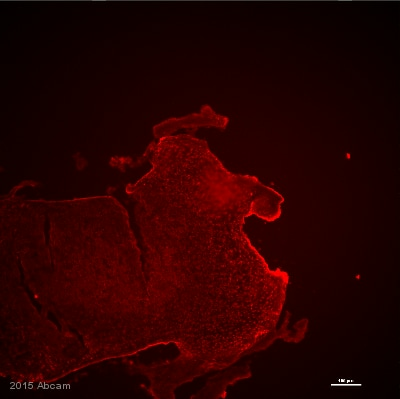 Immunofluorescence analysis of Human articular chondrocytes, staining Collagen II with ab34712. Cells were fixed with paraformaldehyde and blocked for 1 hour with 1% BSA. Cells were incubated with primary antibody overnight at 4°C. 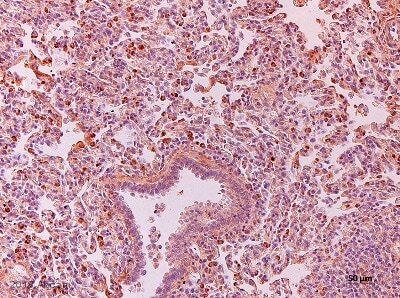 An Alexa Fluor® 594-conjugated goat anti-rabbit polyclonal IgG (ab150080) was used as the secondary antibody. Immunohistochemistry (Formalin/PFA-fixed paraffin-embedded sections) - Anti-Collagen II antibody (ab34712)Voissiere A et al. Development and characterization of a human three-dimensional chondrosarcoma culture for in vitro drug testing. PLoS One 12:e0181340 (2017). Day 7, Day 14 and Day 20 spheroids were fixed using 10% formalin, dehydrated with ethanol, and paraffin-embedded. Sections 5 μm thick were cut and adhered to poly-l-lysine-coated glass microscope slides. Immunofluorescence of Collagen II (Green) was examined using ab34712 at 1/200 dilution. After deparaffinization and rehydration, antigen retrieval was conducted by incubating the slides in boiling 10 mM citrate buffer (pH 6) with 0.05% Tween (v/v) (30 minutes) or by treatment with proteinase K (20 μg/mL, 2 minutes). Blue represents nuclei staining. Controls were obtained by omitting primary antibody but using comparative illumination parameters. Immunohistochemistry (Formalin/PFA-fixed paraffin-embedded sections) - Anti-Collagen II antibody (ab34712)Sonomoto K et al. Spontaneous Differentiation of Human Mesenchymal Stem Cells on Poly-Lactic-Co-Glycolic Acid Nano-Fiber Scaffold. PLoS One 11:e0153231 (2016). Formalin-fixed, paraffin-embedded Mesenchymal stem cells stained for collagen II using ab34712 at 1/100 dilution i immunohistochemical analysis. Healthy donor-derived MSCs were injected into the center of nano-fiber plugs and cultured in MSCGM for the specified period. The samples were assessed immunohistochemically for the expression of type-II collagen on Days 7 and 28. Scale bars, 50 μm. ab34712 staining Collagen II in Chicken embryonic sternal chondrocyte P17 cells by ICC/IF (Immunocytochemistry/immunofluorescence). Cells were fixed with paraformaldehyde, permeabilzed with PBS + Tween 20 and blocked with 6% serum for 1 hour at 4°C. Samples were incubated with primary antibody (1/200) for 8 hours at 4°C. An Alexa Fluor®594-conjugated goat anti-rabbit IgG (ab150080) polyclonal (1/1000) was used as the secondary antibody. Publishing research using ab34712? Please let us know so that we can cite the reference in this datasheet. which antigen retrieval method was used in IHC-P? This antibody has been designed to specifically bind to the three dimensional epitope of the collagen II protein under native conditions. It has been found in house, and has been reported by other customers of this antibody that some batches of this antibody work under denatured conditions. It would therefore be worthwhile to try the antibody under denaturing conditions. However, the antibody is likely to perform better under non-denaturing conditions. ich hoffe ihnen hiermit alle notwendigen Daten zur Verfügung gestellt zu haben. Eine kurze Rückmeldung, ob sie alles erhalten haben wäre nett. Vielen Dank dafür, dass Sie sich die Zeit genommen haben, unseren Fragebogen auszufüllen. Es tut mir leid, dass Sie Probleme mit unserem Antikörper hatten. Da das Färbemuster mit Isotypkontrolle und dem spezifischen Antikörper gleich aussieht, deutet das daraufhin, dass das Problem nicht die Isotypekontrolle sondern eher, dass die spezifische Färbung nicht spezifisch ist. Haben Sie eine "no primary" Kontrolle gemacht um auszuschließen, dass die Färbung vom sekundären Antikörper alleine stammt? Wenn diese Kontrolle negative ist, deutet es darauf hin, dass beide Antikörper (spezifisch und Isotypkontrolle) unspezifisch binden. Um dies zu verbessern, schlage ich vor die Antigendemaskierung zu verändern. ab34712 und ab128142 wurden mit 0.01 M sodium citrate buffer (pH 6.0 bei 99-100°C - 20 min) getestet. Außerdem ist es möglich dass, die Antikörper mit etwas aus dem Blockierungsbuffer reagieren und ich empfehle deshalb 10% Serum zu verwenden und kein BSA. Würden Sie mir bitte mitteilen, wie die Entkalkung gemacht wurde. Ist diese nicht optimal, können eigenartige Färbemuster auftreten.